The world population is expected to grow to over 9 billion by 2050, an exponential trend that has continued for several hundred years and see no end it site. Megaregions as people flock to cities and industry will be commonplace. The question is how will water supplies be impacted, or impact this trend. Interestingly it varies everywhere. For example, China and India are not expected to reap major benefits from climate changes, so their economies will grow as will populations. They continue to construct coal fired power plants, and impact carbon dioxide and pollution levels, which does not help the climate issues. Recall that Beijing was basically shut down for several days recent due to smog – seems like I recall the first air pollution regulations stemming from Henry the VIII decision to move the coal plants out of London during his reign 500 years ago because of pollution, but perhaps we need to relearn history J. Of course China and India are expected to be less affected than the more historically developed countries in the northern latitudes that have been moving to renewable and less impactful power solutions with good reason. 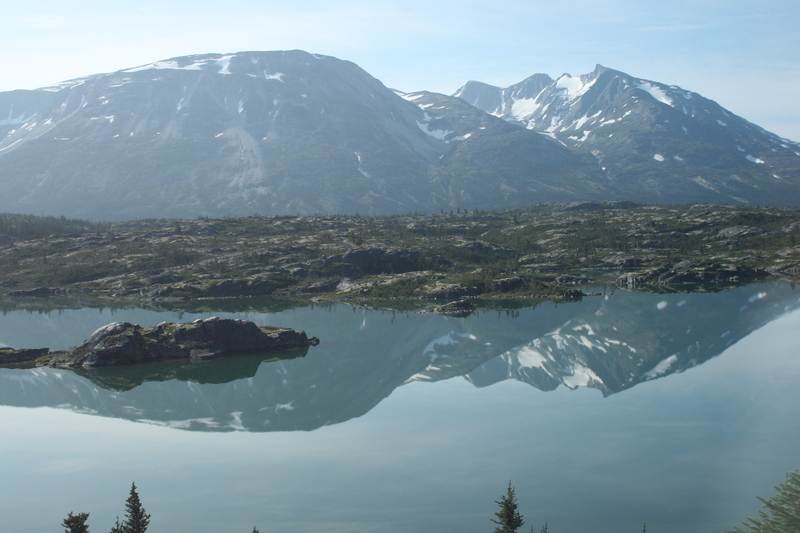 Aside from these two economies, the rest of the northern latitudes are likely to see changes in temperature, variation in precipitation patterns and drought frequency changes. That has major impacts for a billion people who will see water supply shortages occur much more often, and create a whole host of “winners” and “losers” in the water supply category. Conflicts may result from the need to change increase water supplies as desperation kicks in. Lawrence Smith, in his book 2050, suggests that while the far northern countries, the US, Russia, the Scandanavian countries, and Canada may see more land for agriculture and more water (at least in some areas), those warmer countries in the sub-Sahara, will become more desperate and dangerous to the world order. Water will be the new oil, and the tipping point for sustainability, akin to peak oil, needs to be developed. The cost will be significant, but the failure will be catastrophic to global economies. This is part of why the global pursuit of renewable power, local solutions and green jobs. It is why the definition of sustainable water supplies continues to evolve as we understand that the impacts, or the constraints of water supplies is far more reaching than most engineers and planners have traditionally dealt with. AWWA published a Sustainable Water CD several years ago. It was a series of papers of different aspects of sustainability as applied to water resources. The last paper summarized the findings and compared it to the initial paper discussion. The conclusion was the concept is evolving. Climate, power, agriculture, natural systems, local economies, local economic contributions to regional and national economies and politics all impact pure science recommendations for water supply allocation. The question is can we overcome the politics to create a optimized science solution to sustain water supplies and economies. An old Native American proverb comes to mind: We do not inherit the Earth from our grandparents, we borrow it from our grandchildren. One of the major issues involved with climate changes is sea level rise. Florida has experienced 9 inches of sea level rise since 1900. Projections are 2-3 feet by 2100, perhaps more. 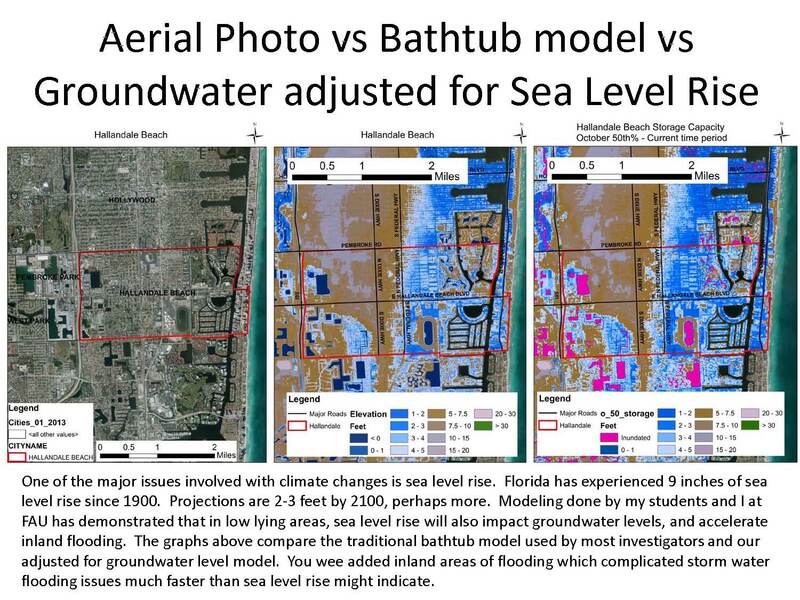 Modeling done by my students and I at FAU has demonstrated that in low lying areas, sea level rise will also impact groundwater levels, and accelerate inland flooding. The graphs above compare the traditional bathtub model used by most investigators and our adjusted for groundwater level model. You wee added inland areas of flooding which complicated storm water flooding issues much faster than sea level rise might indicate. This question has been asked a couple times on on-line discussion groups. It usually results in a short list of answers. In the last post, I outlined the number one answer – getting a handle on failing infrastructure. The next issue has to do with water supplies. You hear the argument that we need to get people to respect that drinking water as a limited resource, develop where water supplies are plentiful as opposed to arid regions that are water poor and protecting water sources instead of rendering it unusable in the process of using it. People (and their jobs) are moving to “more favorable” (read: warmer, more arid) climates, so people are now actually trying to grow rice and develop golf courses in the deserts of the Southwest US and complaining about “drought” conditions. The sustainability of groundwater supplies is often noted as a problem because much of the west relies on groundwater for agricultural irrigation. Having a 50 or 100 year management plan for an aquifer, which is how to insure there is water to last 50 or 100 years, is shortsighted, even though it doesn’t sound like it. Long term these areas could run out of water which will create significant economic impacts to these communities. More professionals should be involved in this discussion: regional growth planners; federal and state funders that offer ‘incentives’ to businesses to relocate their workers; city and county governments that accept these ‘incentives’ to beef up their budgets. But just as cities market their community to developers and industry, it is interesting that marketing services is another issue. I had a conversation where an elected official said it was inappropriate for government to market. Yet the bottled water industry does, power companies do, and cell phone companies do. Utilities ignore the people that put fliers on houses asking our residents to take a sample of their water, and then attacking the quality of our drinking water by explaining that having calcium and chlorine in the water is bad, should have been addressed long ago. Of course calcium and chlorine are in the water! Chlorine disinfects the water and then keeps the distribution system clean (especially an issue in warmer climates with TOC in the water). Our public is uneducated and we have been out-marketed for scare dollars for 40 years. That is an elected official, but also a water official problem. Will Federal Deficits Drag Water Utilities Down? Do we or don’t we have a spending problem. Well let’s see how serious we think this really is. Banks usually figure you can spend up to 40% of your take home pay on your house expenses. That includes electric and water, so let’s assume 1/3 of your take home pay. If you earn $50,000 per year, your take home pay is in the $37,000 per year range. That means you can spend $1000 per month your mortgage. If the interest rate is 3%, you can qualify to buy a house loan of $235,000, or 4.7 times your total income, or 6.36 times your net income. So let’s see how serious the federal deficit is. The proposed federal government income for 2013 is 2.9 trillion, or 17.8% of the GDP. Of course the Feds don’t pay taxes, so you can figure the 6.36 x net income yields So 4.7 times $2.9 Trillion is $18.4 Trillion. The 3% percent is actually higher that the current rates the feds are paying (that’s our mortgage rate), so given that our current federal debt is $16.3 Trillion, so there is some room to spare and the feds could raise revenues, unlike you and I. Paul Krugman is smiling because this supports his argument. But is does speak to the need for one of two things: either raise more revenues, or grow the economy to create more revenues. The key is receipts will probably track with the economy, so as it improves, the deficits will reduce. If the economy improves, that improves the outlook for construction, water sales, sewer sales, and local revenues. That means maybe we can spend more on infrastructure locally. Maybe we can look at adaptations to bigger issue like sea level rise or changing precipitation patterns to secure sustainable water supplies. Most are regional issues, so help beyond the local level will be requir3d. Washington? What do you believe are the three biggest water challenges in the U.S.? This question has been asked a couple times on on-line discussion groups. It usually results in a short list of answers. The number one answer is usually getting a handle on failing infrastructure. The US built fantastic infrastructure systems that allowed our economy to grow and use to be productive, but like all tools and equipment, it degrades, or wears out with time. In addition, newer infrastructure is more efficient and works better. In many ways we are victims of our own success. People have grown used to the fact that water is abundant, cheap, and safe. Open the tap and here it comes. Flush the toilet and there it goes, without a thought as to what is involved to produce, treat and distribute potable water as well as to collect, treat, and discharge wastewater. Looking to the future, we should take education as one of our challenges. Our economy and out way of life requires access to high quality water and waste water. So this will continue to be critical. But utilities have not been proactive in explaining the condition of buried infrastructure in particular, and need more data. The same goes for roadways and many buildings. Cities are sitting on crumbling systems that have suffered from lack of adequate funding to consistently maintain and upgrade. In part this is because some believe that clean drinking water is a right instead of a privilege to be paid for. We gladly pay hundreds of dollars per month for cable television and cell phones, but scream at the costs for water delivered to out tap. The discussion usually continues along the lines of utilities are funding at less than half the level needed to meet the 30 year demands while relying on the federal government, which is trying to get out of funding for infrastructure for local utilities. Utilities are a local issue which is some ways makes this easier. Our local leaders to send help with the education (after we educate them), send less money going to the general funds and more retained by utilities. Perhaps where we have failed is in educating the public. Public agencies are almost always reactive, as opposed to pro-active, which is why we continuously end up in defensive positions and at the lower end of the spending priorities. So we keep deferring needed maintenance. The life cycle analysis concepts used in business would help. A 20 year old truck, pump, backhoe, etc just aren’t cost effective to operate and maintain. We are not very successful at getting this point across. Money is an issue, and will always be, but the fact that local officials are not stressed about infrastructure is in part because utility personnel are very good at our jobs, minimizing disruptions and keeping the public safe. We are not “squeaky wheels” and we don’t market our product at all. Afterall, is cable or your phone really more valuable that water and sewer?